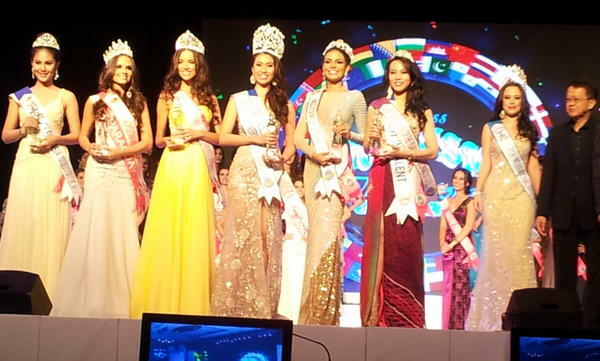 Rizzini Alexis Gomez was crowned Miss Tourism International 2012 / 2013 winner last night in Malaysia. Also in the Top 10 semi-finalists were the candidates from China, India, New Zealand and Russia. Miss Philippines Rizzini Alexis Gomez, a 22-year-old Registered Nurse from Cebu, emerged as the winner among the 56 candidates (a record number) during the Miss Tourism International 2012 World Finals held on New Year's Eve, December 31, 2012, at Petaling Jaya, Malaysia. She becomes the 16th Miss Tourism International winner and the 2nd from the Philippines after Maria Esperanza in 2000. Truly, the Philippines ruled 2012 pageantry, its best year ever! Before Rizzini, transvestite Kevin Balot was crowned Miss International Queen 2012 in Thailand, then June Macasaet was elected Manhunt International 2012 also in Thailand, Philippine Volcanoes member Andrew Wolff was 1st Runner Up at Mr. World 2012 in London and just over a week ago, Janine Tugonon finished also as 1st Runner Up in the Miss Universe 2012 pageant held in Las Vegas, USA. Supranational 2012 3rd Runner Up, Stephanie Stefanowitz as Miss Earth Air 2012, Queenierich Rehman's Top 15 placement in Miss World, Nicole Schmitz also a semi-finalist in Miss International, and a lot more.